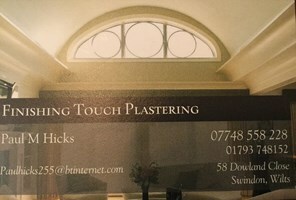 Finishing Touch Plastering - Plasterer based in Swindon, Wiltshire. Welcome to Finishing Touch Plastering. Our company began in 2006 and we provide both interior and exterior plastering solutions to both domestic and commercial customers. We are happy to take a range of work whether it’s your entire house or just a small patch job. We are a small business so reputation and loyalty is important to us. We are proud to have a client base that use our services repeatedly. Call me, Paul, for more information or perhaps book a visit.